To remove the inner brake pad "1", push down on the brake caliper bracket so that there is space to remove the brake pad. 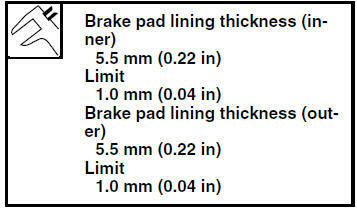 Brake pad wear limit "a" Out of specification → Replace the brake pads as a set. Always install new brake pads and a new brake pad spring as a set. a. Connect a clear plastic hose tightly to the bleed screw. Put the other end of the hose into an open container. b. Loosen the bleed screw and push the brake caliper piston into the brake caliper with your finger. d. Install a new brake pad spring "1" and new brake pads. Install the brake pad spring as shown. recommended brake fluid to the proper level.